Cruisin' in a new Cadillac...no hands! General Motors just told all those damned kids to get the hell off its lawn. Everyone knows the auto industry is changing. In the future, cars will run on electricity and they will drive themselves. Instead of owning cars, most people will just ride in them when they need to. Since all of this change is creating a ton of opportunity, lots of companies are pouring into the field. Companies like the ride-sharing firm Uber, electric car maker Tesla (TSLA) and Google's Waymo (GOOG), which is working on self-driving cars, all want a piece of the action. But on Thursday, GM announced plans to take the whole enchilada for itself: The automaker said it will make the cars, write the code and sell the rides. But can a 110-year-old automaker move fast enough to pull this off? In terms of electric cars, Tesla gets the bulk of the attention. But GM handily beat Tesla's "affordable" Model 3 to market with its own Chevrolet Bolt EV. Over 20,000 Bolt EV's have been sold so far this year. Tesla has a lot of orders but, at last count, has produced only a few hundred Model 3's while it struggles with production issues. 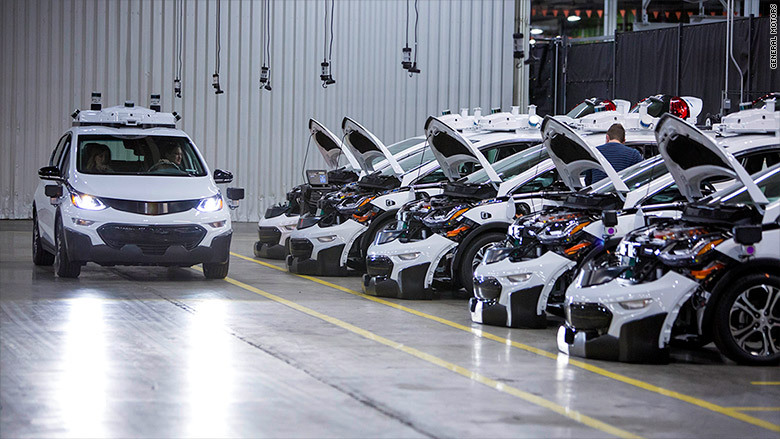 GM has also been working with its subsidiary, Cruise Automation, to make self driving versions of the Bolt EV, which are being tested in California, Michigan, Arizona and, soon, New York. By some time in 2019, those driverless cars will start giving rides to passengers. That may seem awfully soon, but start-ups like Lyft and Waymo could be doing the same thing by then, too. General Motors has already started building automous cars in an assembly line to better learn the intracacies involved. GM's biggest advantage is that it well understands one of the biggest challenges: how to develop and manufacture cars with complex technology in huge numbers, said Sam Abuelsamid, a transportation analyst with Navigant Research. 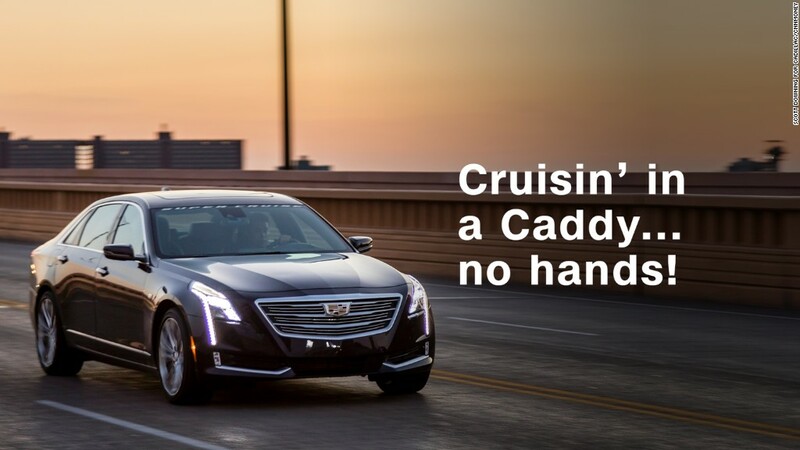 Besides the autonomous Bolts, GM already has Cadillac cars on the market that can drive hands-free on highways. Without drivers to pay or expensive gasoline to put in the tank, autonomous taxi rides will become much cheaper than today's taxi rides. That will make ride-sharing a much more compelling idea for consumers. 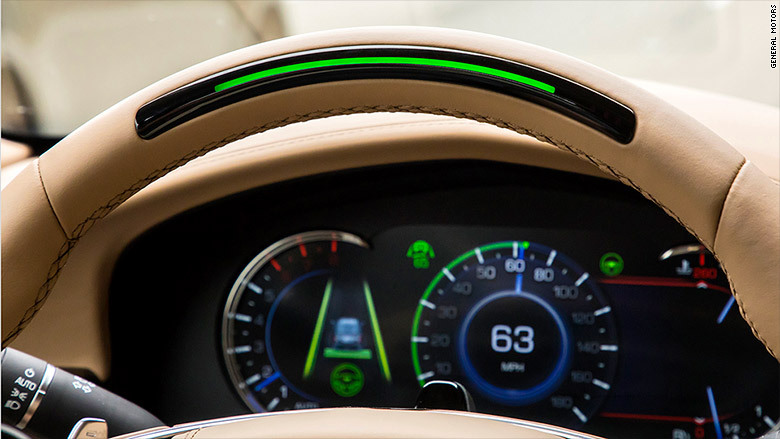 GM's Cadillac Super Cruise has given the company vital experience with producing semi-autonomous driving systems for customer use. But these cars won't just be giving rides. They will also be gathering data. Driverless cars are, in fact, voracious data gathering machines. They have radar, lasers, cameras and all sorts of sensors that can gather information that can be sent to server farms that never forget anything. And that data is valuable. One potential customer base, GM said Thursday, will be insurance companies. GM's cars will witness lots of fender benders and will be able to share that video with insurers to quickly settle claims. Other companies will buy the map data these cars produce and pay to place ads and offer services and games for bored passengers. The potential ways to make money are almost limitless, Abuelsamid said. Soon, just riding in a car becomes far cheaper and more convenient than owning one. This may seem like corporate suicide for a company that makes its money selling cars. But, according to GM, it's not. That's because under this new business model, instead of selling each car once, every vehicle it makes will generate a continuous stream of revenue.